Today we have been invited to Christmas dinner with Alyona's colleagues from "YourMove" James Muir (estate agency where she is working). 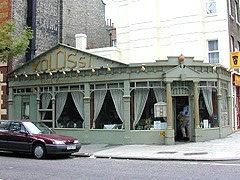 We went to Greek restaurant called "Kolossi" in the centre of London (56-60 Rosebery Avenue, London). The food and the company were EXCELLENT! Personally, it was one of the best restaurants I have been in London. It was small, cosy restaurant with home style kitchen and VERY Greek service (which is open and friendly). We stayed there for almost 4 hours, eating and chatting away. During that time, there was never an empty table, so if any of you are planning to come over to eat make sure you book a table before. I totally agree! The restaurant was PERFECT!!! And they have a very good selection of vegetarian dishes. And the company was GREAT!!! ha, once i am in London, we will go to this place again and then i will tell you if it is indeed real Greek place. very recently here, right "next door' in Aventura we have had a dinner in so-called Thira. i was shockingly surprised with the food and service, even the lack of live music did not affect my mood and enjoynement. or, it would be better to take you to that place during your next staying in Miami. you, guys, are so right - the great comapny - this is what makes a difference!